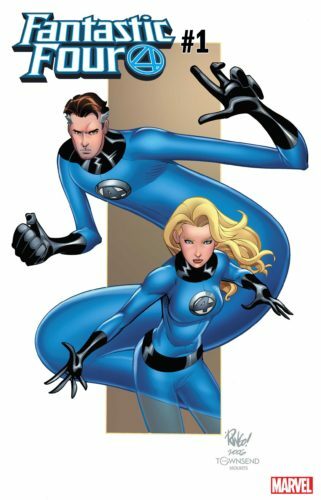 I’m going to agree with Marvel Executive Editor Tom Brevoort — Mark Waid and Mike Wieringo’s run on Fantastic Four was one of the best in the last 30 years. Lee and Kirby, of course, topped it all. And we’ve got to honor John Byrne. But Waid and Wieringo made me fall in love with the characters all over again, and Wieringo’s untimely passing was a loss to the industry. To find out there’s one more previously unseen piece of Fantastic Four art by him, that’s exciting. I was already excited about the return of the Fantastic Four by Dan Slott and Sara Pichelli — now I have to get a particular cover. This August, 57 years to the day of the FANTASTIC FOUR’s original debut, Marvel’s First Family returns as the Fantastic Four make their dramatic homecoming to the Marvel Universe! In celebration of the much-anticipated launch of FANTASTIC FOUR #1, Marvel is excited to reveal an existing piece of art from one of Fantastic Four’s best known artists, the late Mike Wieringo—never before seen as a cover until now! “As the artist of my favorite run editing FANTASTIC FOUR, it’s especially nice that the late, great Mike Wieringo can make a contribution to the launch of this new one,” added SVP and Executive Editor Tom Brevoort. Don’t miss the epic return of Johnny, Ben, Sue, and Reed on August 8th, when FANTASTIC FOUR #1 hits your local comic shop!